Team Audio Xperts Reaches Top Spot in USA! WHO OWNS THE #1 SPOT IN MASTER AND MODEX CLASS?…..
June was a busy month for Team Audio Xperts with 2 competitions on the calender. As you know from our newsletter in early June, the Visalia show was the first triple point event and there was tough competition from So Cal in attendance. We came away with a ton of hardware at that one, and next stop was Modesto, Ca. for the annual American Graffiti Car Show and Festival. If you remember, this was the first show Scott, Paco and I attended with Dennis last year to scope out the competition scene. We didn’t know what to expect, since we had been out of the competition scene for 16 years. We were very impressed with the quality of systems and installations and where inspired to build a couple of cars and jump back into the mix! Time goes by so quickly, it’s hard to imagine it’s already been one year. This time around we showed up ready to compete and we had tough competition. Fred from Arc Audio was competing in the Master class with his Saturn, which dominated the circuit last year and actually took top honors at last years event. In the Modex class, Scott was up up against the Dodge Ram truck that has outpointed him twice this year in Fresno and in Visalia, so the competition was fierce. In the end Scott scored an 83.3 which was 8.3 points ahead of the Dodge truck, and good enough for a first place win in the Modex class and SQ Best of Show honors as well! Great job Scott! He was up pretty late the night before tuning his ride and I have to say it paid off big! The Scion was up against Fred as well as the show promoter Aubrey who, with his Chrysler 300, also had major success on last years circuit. At the end of the day the Scion came away with first place in the Master class by only a few points, it was close! We also took a first place in the two seat category in our first attempt in that class, as well as first place in Extreme install…a few more trophies to add to this years collection. I am very proud of my team, both Paco and Scott possess major skills and together we have been able to build 2 cars that are currently in the number one spot in their respective classes in MECA, the organization in which we compete in. It’s amazing to me that we were able to do so much in just one year, and I want to take this time to give my thanks to everyone who has helped us out over the year! Emilios at Dynaudio, Scott B. at Hybrid Audio, Fred at Arc Audio, John at Stinger, and Randy at Super Soundproofing has also helped out tremendously with his line of soundproofing products. Look out for new upgrades coming soon! I know, we must be crazy to make any changes to our cars when they are doing so well, but we are never satisfied! 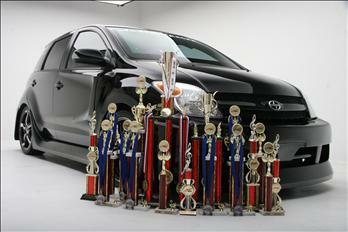 As good as the Scion is, there are places to improve, so if we are trying to be the best, we must continue to improve. Also, below we have one of the preview pics from a photo shoot done in Modesto in June. Fred from Arc Audio, also an accomplished photographer, invited me to bring the Scion to a professional studio designed specifically for shooting cars. They were shooting all day for a magazine spot that will showcase their demo cars, so we may see the Scion featured in a spot this year…I’ll be sure to keep you all posted! JBL MS8 Processor Finally Arrives! Yes, it’s finally here! After a three year wait, JBL has finally launched the MS8 digital sound processor! We had a chance to audition the MS8 first hand earlier this month when they arrived and It did not dissapoint! We installed one in the Scion xa competition car and it was able to get us to around 90% of where we are with the tuning of the system. To let you know how much of an accomplishment that is, we have close to 60 hours of tuning time on our Scion and in 15 minutes we were 90% there. We have also seen some of our competitors on the circuit using this processor and grabbing the highest scores to date! This is truly great news for all of our clients who share in our passion for music and cars! We can now offer competition level performance for a fraction of the cost. And, since the MS8 has an internal 8 channel amplifier you can start with as little as the MS8 processor, subwoofer, and subwoofer amp! We have them in stock now, so call for an appointment and you can be enjoying your music in your ride the way the recording engineer intended! Stay tuned for my competition update email with some outstanding news for Team Audio Xperts! The right answer to the question “What can I do to improve the sound of my car audio system?” used to depend on the quality and configuration of your system’s particular components. Today’s answer is, “Just get a JBL® MS-8 System Integration Digital Processor.” The MS-8 is a new kind of car audio component, an automatic equalizer that can optimize any vehicle’s performance in about ten minutes flat. Just follow the step-by-step setup procedure and the MS-8 maximizes frequency response, bass performance, dynamics, clarity, detail and stereo imaging — every important parameter of sonic greatness — from virtually any combination of factory-installed and/or aftermarket components. And after it works its magic? You’ll be left with a 31-band graphic equalizer and a full set of preamp controls to fine-tune day-to-day operations. You are currently browsing the Audioxperts's Blog blog archives for July, 2010.